9463 The Werewolf is a Monster Fighters set released in May 2012. The set includes a tree, a car, Major Quinton Steele, and the Werewolf. 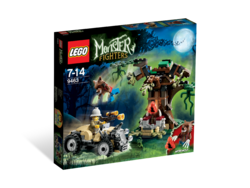 The set features two minifigures; Major Quinton Steele (The Monster Fighter) and the Werewolf (The Monster). The set includes a brown tree with a small pedestal to place the Moonstone and a small catapult on top with room to place the Werewolf. It also includes Major Quintin Steele's tan hot rod. The tree is the biggest part of the set. It is multicolored and is green, tan, and brown. A catapult is built into the top of the tree that can fire the werewolf. The catapult is hidden by foliage the rest of the time. The pedestal part includes four bone pieces and a raised piece to place the orange Werewolf Moonstone on. The hot rod has four weapon holsters to place pistols as the engine and the Major's blunderbuss gun can be held on the side of the car. The car has four headlights, a windshield, a steering wheel, a silver frog piece as a car ornament and the end of the hot rod, and the driver's area. The driver can sit down, but stands in the image. The car has two bigger wheels for the back and two smaller in the front, a style which is used in many Monster Fighters sets. Based in the deep, dark Drachwald Forest, the Werewolf lives, and protects the Werewolf moonstone from the Monster Fighters, and his human arch-enemy, Major Quinton Steele, who is armed with his blunderbus, and enjoys hunting exotic prey. The set's story is that the Major is out looking for the moonstone, and then sees the moonstone, and sitting rather invitingly for the Major, then, The Werewolf tries to pounce on the Major using the tree function in the tree. The Werewolf's new claw mould is glow in the dark and is claws are the same mould as the ones used for Wolverine but in a different colour. On the side of the box, there is a printing error, instead of showing the official image, it shows the preliminary image of the set. This is a description taken from LEGO.com. Please do not modify it. (visit this item's product page) Avoid the treetop ambush and recover the Werewolf's moonstone! Avoid the Werewolf's ambush attack! Watch out for the Werewolf's glow-in-the-dark claws! The Werewolf standing on the tree's feature. The affect the feature has on the tree. Facts about "9463 The Werewolf"